You are here: Home / Weekly Columns / Opinion / Asus Rog Zephyrus S: How Heat Management Works in Moments of Stress. Asus Rog Zephyrus S: How Heat Management Works in Moments of Stress. 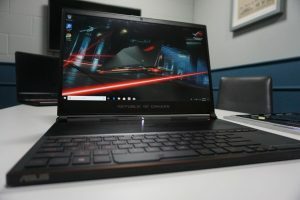 (ThyBlackMan.com) Asus Rog Zephyrus S is the latest entry in Asus gaming laptop product line. The Zephyrus S is now more powerful, more thermally efficient, and is considered the world’s thinnest gaming laptop. The keypad is still in the same place as its predecessor, so obviously, that’s weird, but that’s not the point we are going to discuss in this post. Such features are more about a user’s personal preferences, so rather debating whether the keypad placement is good or not, let’s have a look at how heat management works in Asus Rog Zephyrus S.
It’s a gaming laptop so it’s pretty obvious that it requires more processing power and as a result, it emits more heat than your normal home or work laptop. So how do they do it with such a sleek design? We looked deeper into the information provided by Asus and have found some interesting facts about how heat management works on Asus Rog Zephyrus S.
The Asus Rog Zephyrus S is 12 percent slimmer than the original laptop model. It is configurable with up to 8th Generation Intel Core i7 six-core CPU. It supports up to NVIDIA GeForce GTX 1070 GPU. Interestingly, its super-narrow bezels help Asus fit a 15.6-inch display into a 14.2-inch chassis. The Intel Core i7-8750H Coffee Lake processor on this laptop offers six cores and is powered by the parallel processing power of 12 threads. The Asus Rog Zephyrus S offers 22 percent improved airflow compared to the traditional laptops. All of its major power components stay under 80°C to improve its durability and reliability. For better airflow, AeroAccelerator fans in this laptop have 17 percent more blades than the original Zephyrus laptop. The laptop’s chassis is just 14.95~15.75mm thick. The world’s thinnest gaming laptop Asus Rog Zephyrus S is wrapped in a metal chassis. For better heat management and to give it a sturdy and reliable frame, Asus uses a mix of aluminum and magnesium alloys. It helps the company give the laptop the strength it requires, and use of metals make it lightweight. For the Rog Zephyrus series laptops, Asus has designed a system called Active Aerodynamic System (AAS). You can find it on the original laptop as well. To see how it works, just lift the lid and you will notice that a vent located beneath the chassis opens and allows for more air intake. On the Zephyrus S, this vent stretches across the back of the laptop’s body resulting in a 22 percent increase in the cool air intake. When Asus introduced the Rog Zephyrus S, many tech bloggers started criticising the company for trackpad and keyboard placement. According to Asus, keeping a keyboard-forward design helps the laptop inhale more cool air. This design helps in cooling from above area by making room for additional air intakes and the laptop’s internal cooling system. One more reason why Asus uses the keyboard-forward layout on Rog Zephyrus S is that this design strategy keeps your hands away from CPU and GPU heat. As a result, when you type, the surface underneath your fingers remains cool. The palm rest is designed to give users a desktop-like feel. Inside the Asus Rog Zephyrus S, there are five heatpipes used to pull heat away from GPU, CPU and the entire VRM circuit responsible for powering these components. For efficient cooling, there are dedicated heatsinks for both CPU and GPU. Managing thermal energy becomes a challenge when you’re designing the world’s thinnest gaming laptop. The Asus Rog Zephyrus handles thermal energy using vents, pipes and four heatsinks at the rear corner which is double the number in the series’s first laptop. The Asus Rog Zephyrus S uses very thin copper fins in heatsinks increasing the surface area to fritter away heat. Like that, there are 250 fins and they also work to reduce resistance to airflow because of their thinness. On the sides, you’ll notice that vents are directed in a way that when you put your palm or use the trackpad, you won’t feel the warm air on your hands. Thanks to Asus engineers for such a thoughtful design. Dust accumulation is one of the biggest problems in laptop and desktop fans, and Asus has found a unique way to keep its laptop protected against dirt and debris. The Asus Rog Zephyrus S comes equipped with self-cleaning fans and has designed anti-dust channels. It means that the fans prevents accumulation of dust and improve cooling. Each fan has 83 blades which are 17 percent more than the original Zephyrus laptop. Amazing design, high-quality display output and the power of Intel CPU and GPU help this ultra-thin gaming laptop stand out and keep it cool. The Asus Rog Zephyrus S gives a positive impression of the technology, design, and engineering.